The poster for writer-director Jeremy Ungar’s thriller, ‘Ride,’ which stars: Bella Thorne, Jessie T. Usher and Will Brill. A chance encounter can influence a person’s entire future. The destiny of three strangers is put to the test on a fateful night in the thriller, ‘Ride.’ RLJE Films is set to follow the characters’ paths when it distributes the movie on DVD and Blu-ray this Tuesday, December 4. In celebration of ‘Ride’s home release, Shockya is offering two lucky winners a DVD of the drama. To enter, email, us at ShockyaGiveaway@aol.com. Let us know that you’re entering to win the ‘Ride’ DVD giveaway in the email’s subject line and message. You have until this Tuesday, the day of the DVD’s distribution, to enter, and you can enter the contest once daily. On Tuesday, we’ll pick the winners at random, and notify them through email. Good luck! RLJE Films will release ‘Ride’ on DVD for an SRP of $29.96, and Blu-ray for an SRP of $29.97. Bonus feature on the thriller’s DVD and Blu-ray includes the original ‘Ride’ short film. 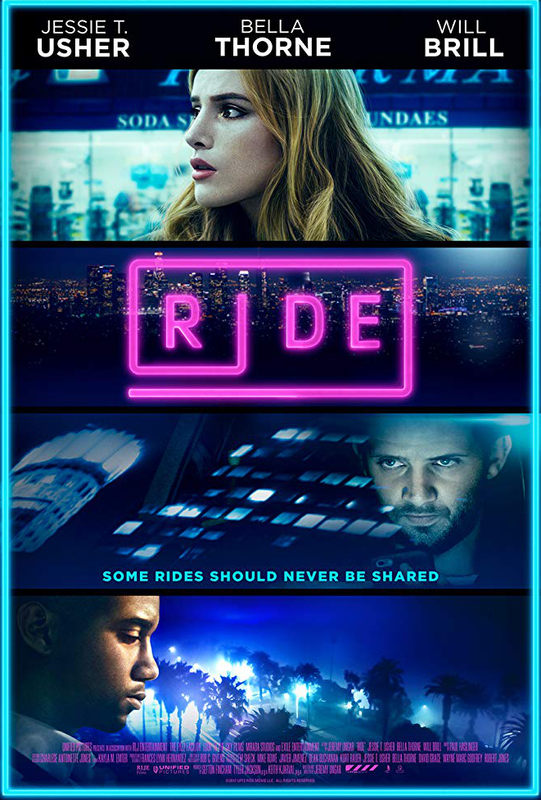 Bella Thorne, Jessie T. Usher (‘Shaft,’ ‘Survivor’s Remorse’) and Will Brill (‘The Marvelous Mrs. Maisel,’ ‘The OA’) star in ‘Ride.’ The movie marks the feature film debut of writer-director Jeremy Ungar. ‘Ride’ follows a struggling actor by day, James (Usher), who pays his bills by driving people around Los Angeles for a ride sharing service. His night starts out like any other, but he can’t believe his luck when he picks up the beautiful Jessica (Thorne), and they immediately hit it off. His next fare, the fast-talking Bruno (Brill), convinces James to go back and invite her to join them for a wild night out. But things take a shocking turn when Bruno, who’s armed with a gun and a twisted idea of fun, forces them on a terrifying, white-knuckle ride that quickly spirals out of control.